As you probably know by now it’s time for a brand new video slot from NetEnt to make an entrance. We’re talking about the sequel Fairytale Legends: Hansel and Gretel following the previous slot in the series Fairytale Legends: Red Riding Hood. The slot is available at Casino Room from now on and to celebrate the launch you will be able to join a special competition. We really think you should check it out since it’s an exclusive opportunity for UK players to enter a raffle at Casino Room. Usually Casino Room’s promotions are closed for UK players but this time it’s free for everyone to participate. You can win a fantastic trip to Hollywood if you’re the lucky winner when it all ends. And if you’re not a player at Casino Room yet you can always sign up now and grab a generous welcome bonus. 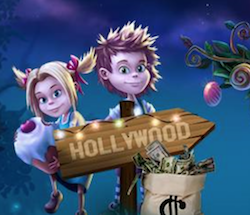 This Monday, the 24th of April, it’s time for Fairytale Legends: Hansel and Gretel to enter the slots at Casino Room. From now on until 23:59 CET on the 30th of April you can log in at the casino every day and collect tickets to the big draw that will be held within three days after the promotion is over. For every £10 you wager on Fairytale Legends: Hansel and Gretel you will get one ticket to the random prize draw at Casino Room. You can earn up to 50 tickets per day! One lucky player will get a trip to Hollywood for two persons including a VIP experience for two with access to Paramount Studios. Except for the 1st prize Casino Room will give away cash prizes as well. None the less but 499 players will get a share of £20 000. These cash prizes are completely free from wagering requirements meaning you will be able to make a withdrawal whenever you feel like it if you win. If you choose to sign up at Casino Room today you will receive 20 free spins instantly on the popular video slot Starburst from NetEnt. As soon as you’ve used your bonus spins you will be able to make your first deposit and get 100% extra to play with up to £500! That’s not all. You will also get another 180 free rounds on Starburst that will be given to you 20 spins a day over nine days. A perfect opportunity to try this casino and get rewarded at the same time!